Well, as you can see, I'm slowly starting to figure out how to bake in Berlin, but there are still many questions to be answered. For example, why do Germans stink at making peanut butter and then sell it at outrageous prices? Why do they give you weird looks when you ask them why they don't use baking soda for baking? Why couldn't I have just grown up with Celsius? Why do I have to resort to making my own brown sugar? Why are Reese's Cups nonexistent when everyone knows they're the most important candy bar ever created? And another question, by the way... how did Germans get so freakishly good at following rules? I mean, if you are a pedestrian crossing the street... aren't the traffic lights more of suggestions? If you look both ways and there's not a car in sight, you can just go, right? I mean, don't get me wrong, I love the Ampelmann. He totally beats the little dude on our crosswalk signals back home. I'm powerless against his merchandise. He's just too cute. I almost feel bad for disobeying him every time I jaywalk. Almost. Despite my love for the Ampelmann, we wait till there are no cars and then we go. It is the American way. Our fellow German pedestrians always stay behind. Once in a while, one will we see we made it across safely and make a mad dash to follow us. More commonly we get an old man glaring at us in disbelief. One time, our fellow pedestrian at the light was an little old lady with a walker. After we crossed the street, ignoring the red Ampelmann, we looked back. The little old lady was hobbling across. A car was quickly approaching. "WAIT!" Samuel pounced back into the middle of the street, flailing his arms heroically to stop the approaching traffic. "Oh thank you," the little old lady said feebly, with a smile, as she slowly finished her journey, "I was just following your example... hehehe." Really, we should stop corrupting little old ladies in their good street crossing habits, but I still haven't learned how to be a good law abiding German yet. 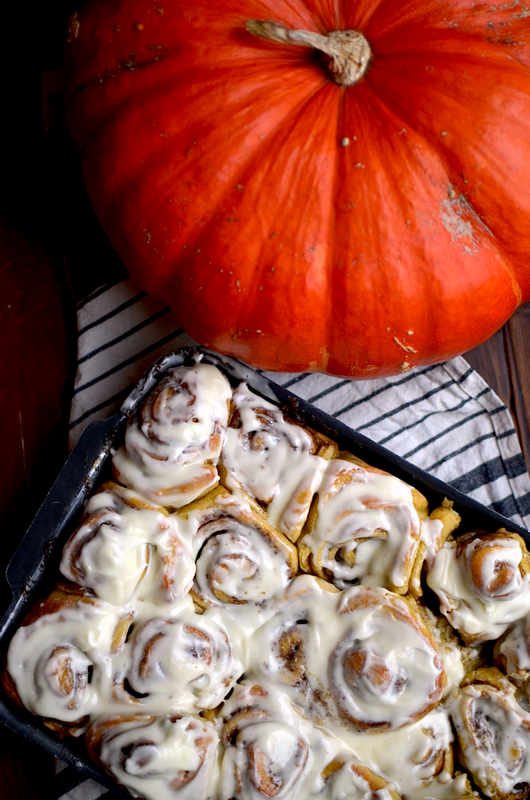 Speaking of my American ways, lets talk about pumpkin. 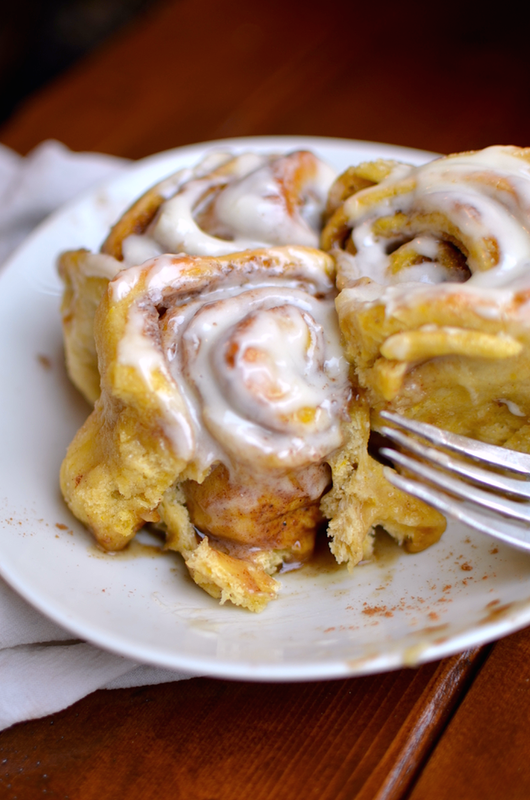 Pumpkin cinnamon rolls specifically. 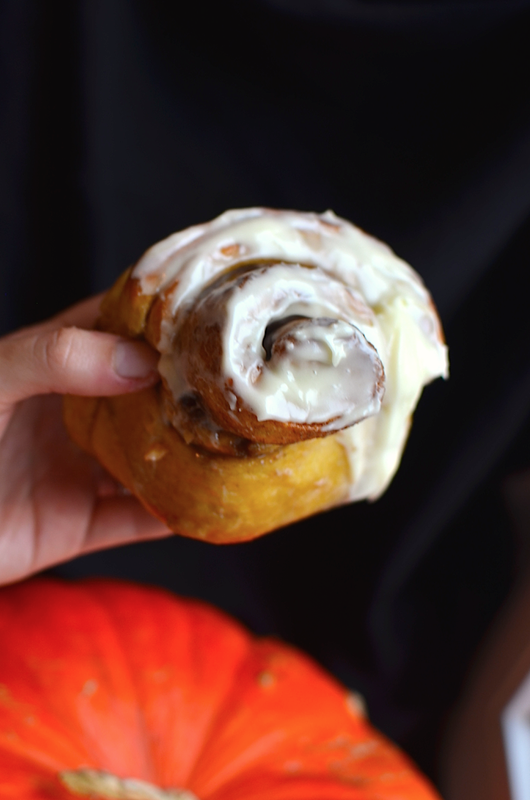 Why wouldn't you want to knead your pumpkin into your bread dough, roll it up with a buttloads of butter, sugar, and spices, and cover it in a picture perfect mascarpone frosting? The real reason for the mascarpone frosting is that mascarpone is super cheap here (as are brie and fresh mozzarella, by the way(!!!!!!!!!!!!!!)). 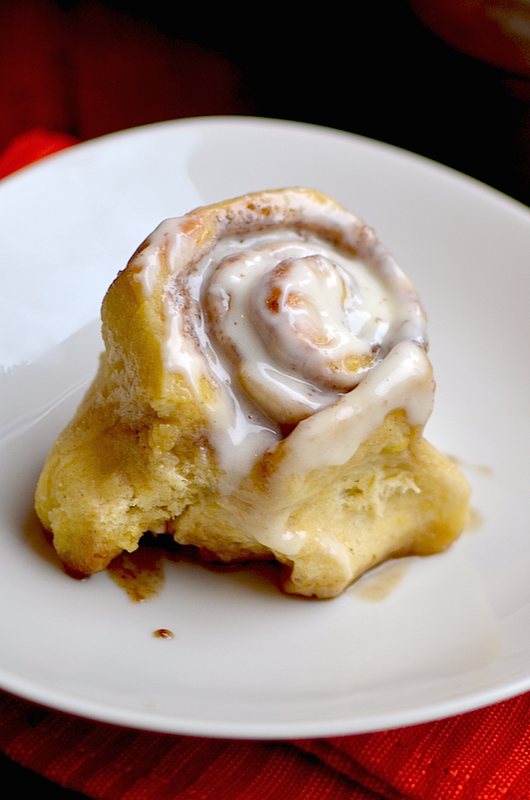 I thought it made a really good frosting, but feel free to use cream cheese instead if you feel like it. Combine the milk and yeast in a large bowl. Let sit for about 3 minutes. Add the sugar, oil, pumpkin and spices. Add the 1 cup of the flour and the salt and mix well. Continue to add the flour one cup at a time. Mix with dough hook or knead on a floured surface by hand for ten minutes. Only add as much flour as you need for it to be manageable. Cover with a damp towel and let rest for 1 hour. 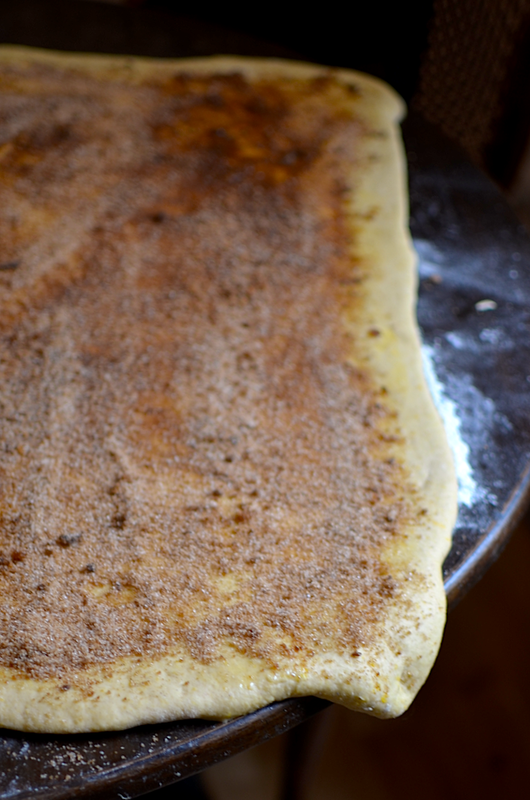 Roll out the dough on a lightly floured surface (don't worry about being picky about the size you roll it out to. I just do it in a rectangle until the dough is about 1/2 inch thick or so). 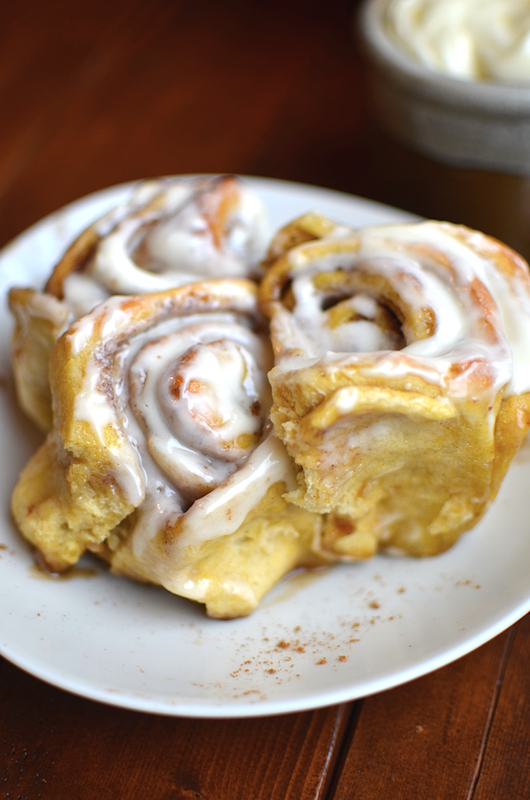 Pour the melted butter onto the dough. Combine the remaining filling ingredients and sprinkle over the buttered dough. 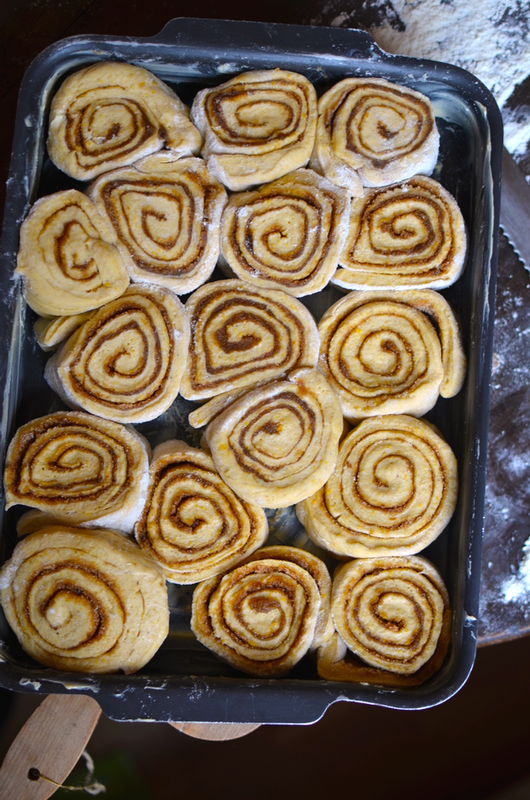 Tightly roll the dough together into a long log (start rolling from the longer side). Cut about 3 inch sections out of the log with a serrated knife (again, don't worry about them being a perfect size). Place them in a well buttered 9x13 inch pan (they should all be touching). Cover with the damp towel and continue to let rise for about 20-30 minutes. 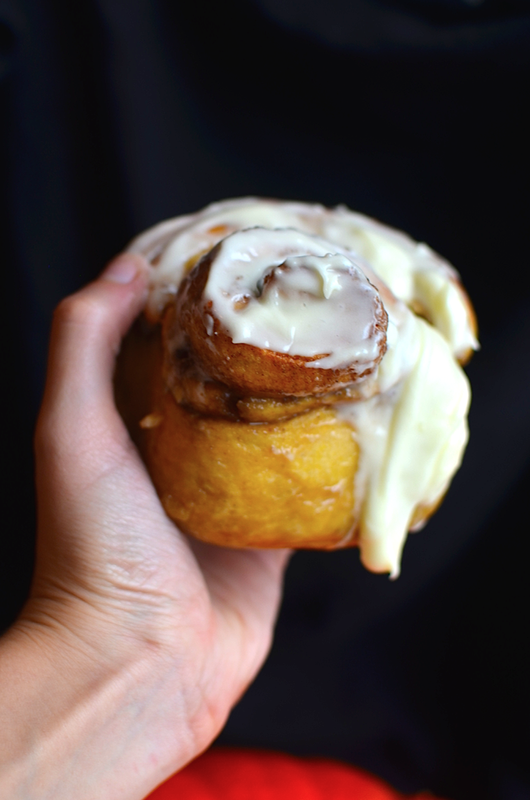 Combine the mascarpone cheese and butter for the frosting. Add the powdered sugar a little at a time and stir until smooth. 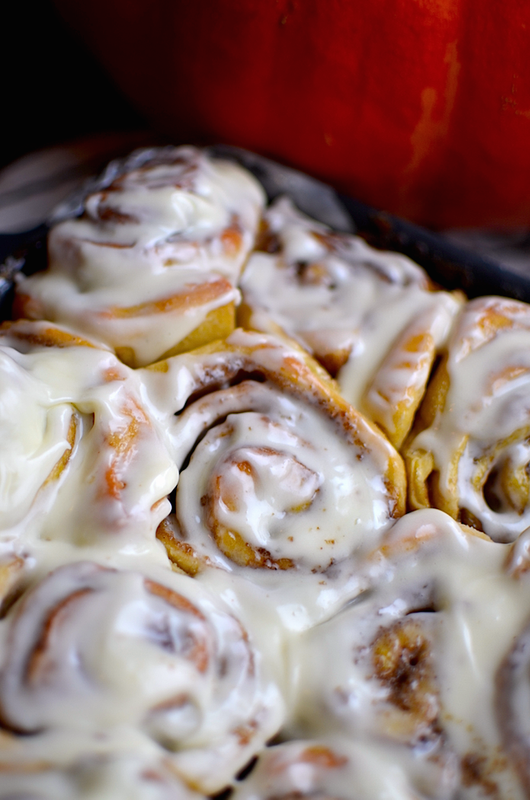 When the cinnamon rolls are done, allow them to cool slightly before frosting them. 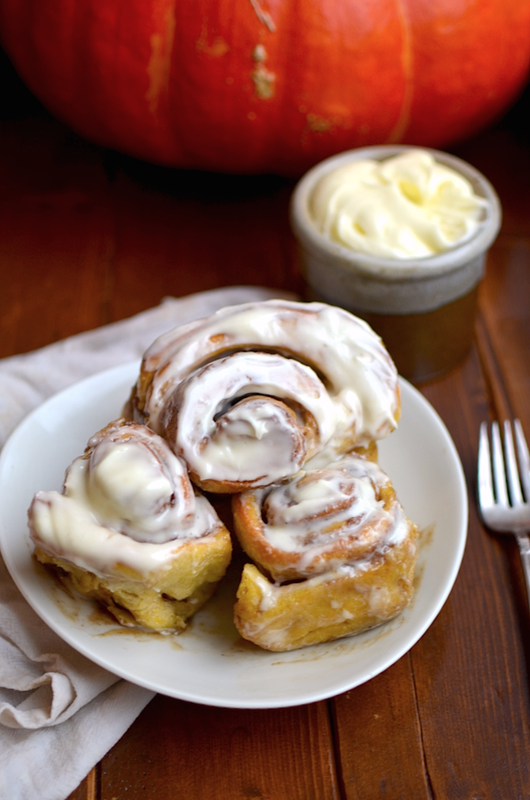 Best eaten immediately, but can also be reheated in the oven at about 350ºF until warm.